Why would an independent retailer have a photo program? DKS is the #1 choice among Independent Retailers in the United States! Photo Kiosks create foot traffic and high margins! – Did you know? Photo services are always a top 5 foot traffic generator. That is exactly the reason “giant” retailers put the term “photo” next to their name on the front of their buildings. 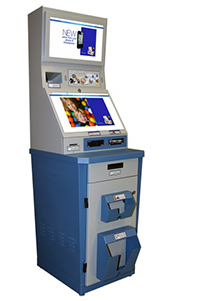 Your photo kiosk will attract new customers, keep existing loyal customers and assist with other in-store product/service sales. Print directly from Facebook account. Print on glossy or matte finish products. Print greeting cars, passport photos, calendars, index prints, collages and photo packages. Enjoy 4×6, 4×8, 5×7, 8×10 and 8×12 prints. Revenue - Typically photo services generate the largest profit margin of any product/service in your store. Smallest Foot Print of any Photo Kiosk made - Roughly 20″ wide by 22″ deep. The best customer support! - Our service and support model is second to none. One, we answer the phone! Two, we are able to control your kiosk from our corporate office. This gives us the ability to train your staff, answer questions while viewing your screen and update or upgrade your kiosk with the latest software features. Software support - DKS has the ability to remotely log into your kiosk and update or upgrade software, provide training with staff and much more. On-Site service - DKS has a network of 3400 technicians across the country for installation and on-site support. Warranty - All purchases come with a 12 month warranty, along with a technical support help desk. Extended service plans also available. Upload images from home or office and then send to print at your in-store photo kiosk. Print from a lifetime of online stored images at your in-store kiosk. Order photo related products and have mailed to any address. Promote Kiosk features and other in-store product/service specials. Create additional revenue by allowing your entrepreneurial spirit to kick in and sell ad space to vendors or neighboring businesses. Great tool to draw attention to your in-store photo kiosk. Modular software and hardware - Ability to add products and services as technology develops and changes. Branding and Marketing Support - DKS offers a variety of merchandising items like 2’x6′ exterior vinyl banners, window posters, bag stuffers and more. DKS Credit Card Program – 50% of invoice paid upon shipment and then the balance paid over 12 equal monthly payments. Lease option – Lease with DKS’s vendor or through the provider of your choice.